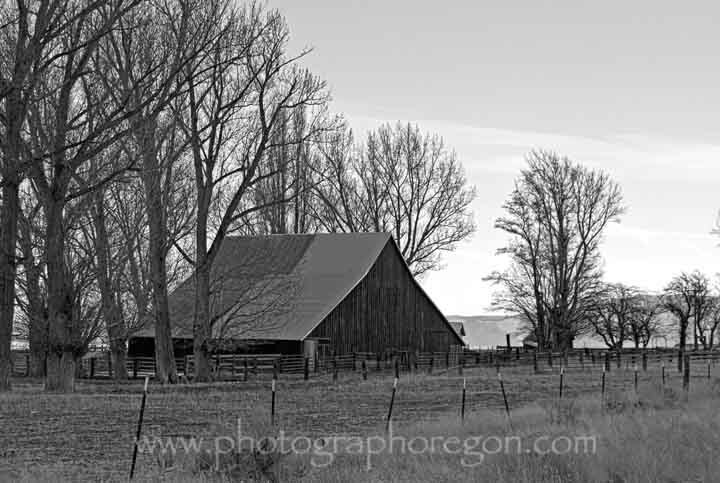 Oregon barns live in pretty much every county. Some are well known and some are local treasures. For now, I am just going to show you what I have found while out and about. As I get more I will break the barn page down by region. 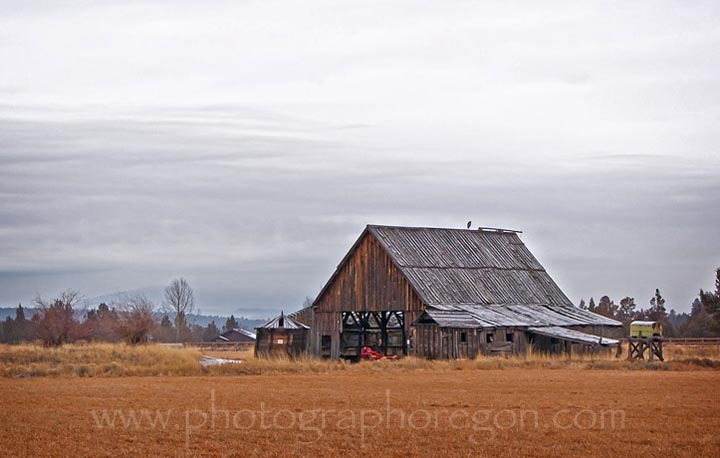 One of our most famous barns, the Dr. Pierce Advertising Barn, resides in Cottage Grove, home of the covered bridges. Email to me : "Thank you so very much for all your links. As to the covered bridges and Cottage Grove - the Pierce's advertisement on the barn front - as of this morning all that is left of the barn are rood sections and wood that could not be salvaged." 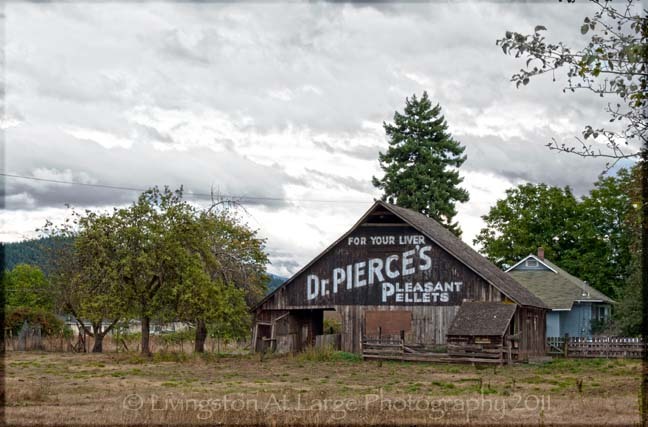 Built in 1900, the advertising was not added until 1912 when the owner of the barn in Cottage Grove allowed Dr. Pierce’s company to paint the side of their barn with the ad. It is unknown what actual compensation was received, but a free coat of paint was a customary payment. Since we are already on the road in Cottage Grove, there are a few more nice vintage barns out there on Row River Rd. Both of these are fairly close to Wildwood Falls , in fact, this red one in the field is right across the road from the Wildwood Falls Park. This white barn is on Row River Rd. It’s not too spectacular in the way of construction but there is usually a passel of goats out there doing funny stuff. 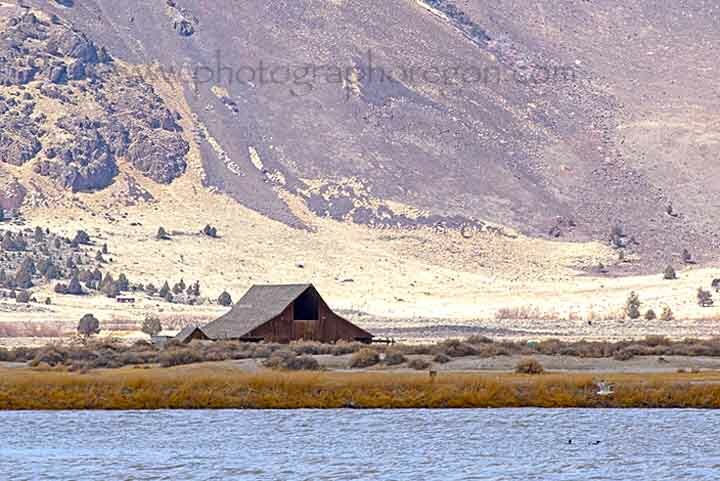 My next favorite place to find Oregon barns is in a totally different part of the state, Summer Lake . Summer Lake , has more great barns than I stopped to photograph. Both of my Summer Lake , trips were taken during birding adventures, Wednesday birding and the Christmas Bird Count , so I was a little limited on my other activities. The No Smoking Barn (it might have another name but for obvious reasons, that’s what it’s called), is right on highway 31. 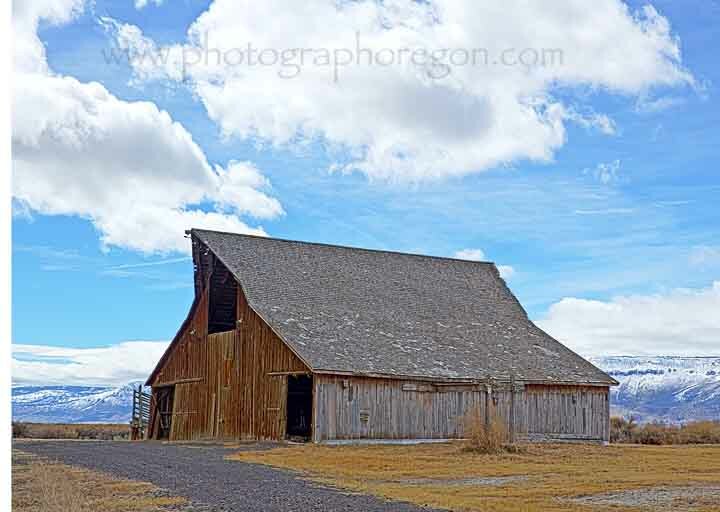 This barn is perfect for some HDR photography playing around. I can’t find any history on it, but I plan on going camping there later on this year and I’ll ask around. 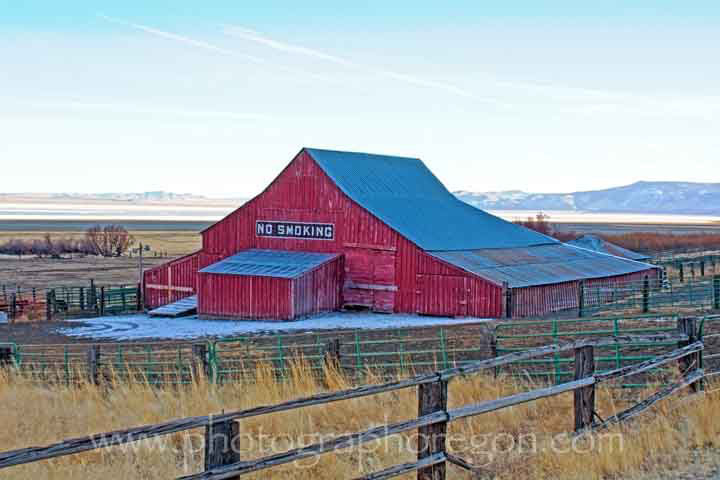 This great big barn is just west of the No Smoking Barn on highway 31. It is also red but very faded and worked really nicely for black and white structure or black and white HDR photography. My favorite of the bunch in Summer Lake , is the River Ranch barn. This barn is located out on the Summer Lake Wildlife Area. To get to it, off of highway 31 take county highway 4-17 (Thousand Springs Ln) east until you see it. Then turn down whichever road will take you there. If you Google or Bing it you won’t find any info but once you get close it is visible from many vistas. Once you get there be mindful of the locals. 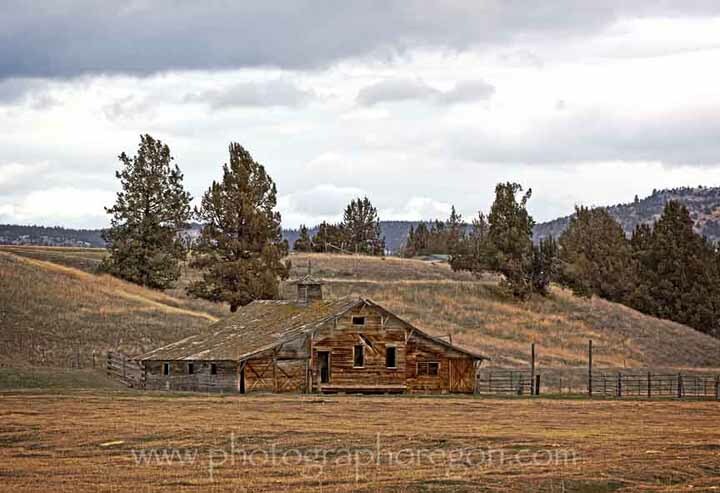 These last barns are in Central Oregon. This one is out on Campbell Ranch Rd Near Elliot Ln. We found it on the way to see the eagle nest. I thought it was really cool but I don’t know anything about it. This big cool old thing is out on the south side of White Rock Loop up off Cline Falls Highway. Notice that Great Blue Heron hanging out on the roof? This last one is in Jefferson County near Haystack Reservoir but I’ll have to go back and get an exact location. It was another Wednesday birding day and I was watching birdies and not street signs. I suppose it won’t help you to say it is across from the field of Horned Larks….. 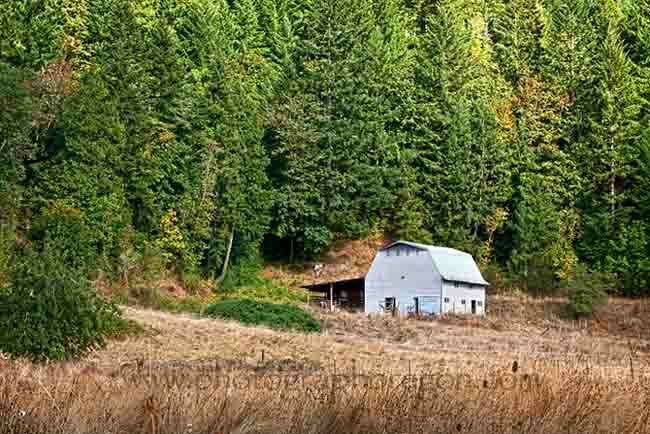 This is just a tiny bit of the Oregon barns. There are some fine ones out on Highway 97 between Madras and Biggs but I always get sidetracked by the Grass Valley Church! 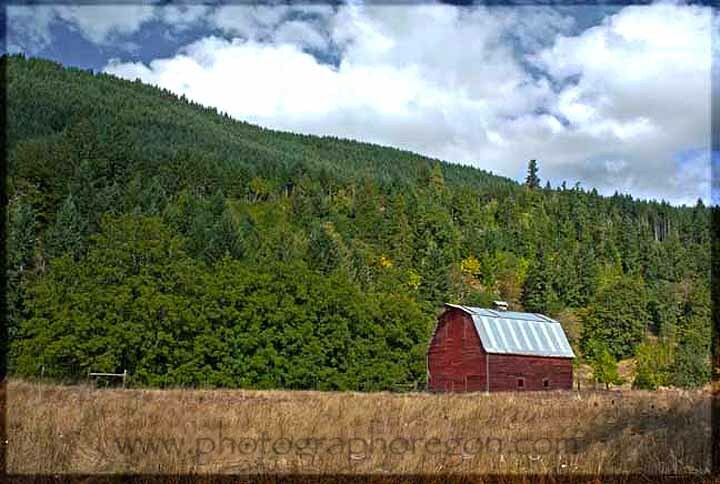 One of the other great Oregon barns I'm really determined to get to is the French Round Barn. There's more info on this one linked below.